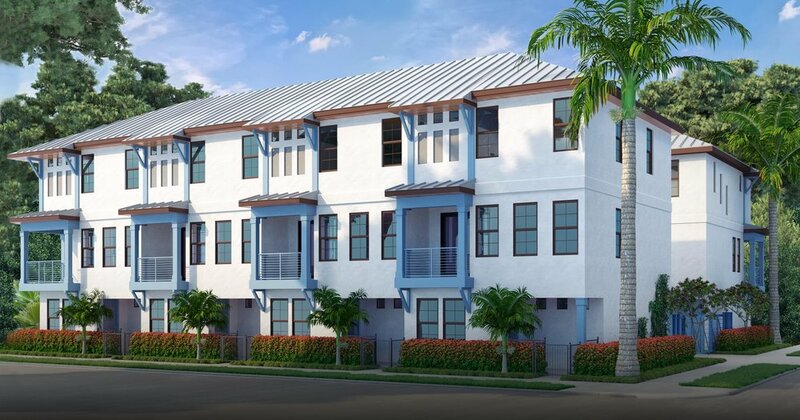 With demand high for new townhomes in Downtown St. Petersburg, it is becoming more common for projects to sell out, sometimes months, before completion. But if you’re currently in the market, you might be in luck as a new boutique development will soon be under construction on the southeast corner of 8th Street South and 3rd Avenue South. 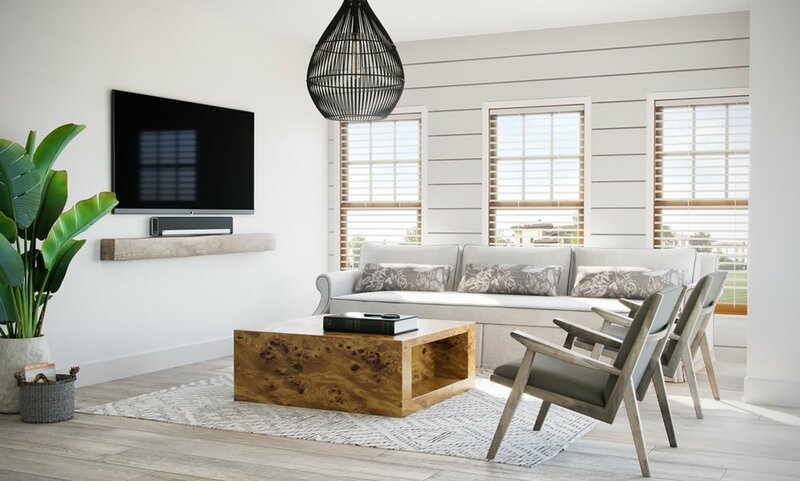 After developing Quattro Beach Drive, a 4-unit project which sold out before completion, Miller saw the need for additional high-end townhome units in the downtown area and began looking for his next project. 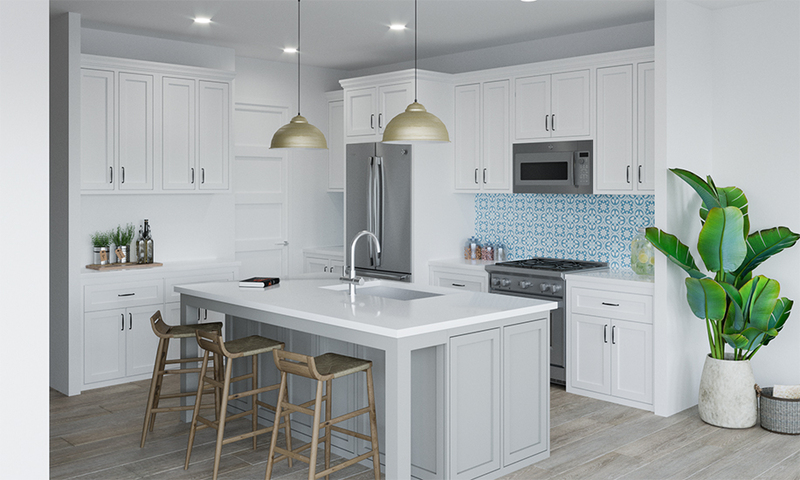 In envisioning the Saint James Townhomes, Miller hoped to emulate the design elements and character of the coastal communities of Florida and the Caribbean. “After completing Quattro, we realized that the Caribbean (or Old Florida) inspired coastal architecture was well received and suited to our subtropical climate in Saint Pete. 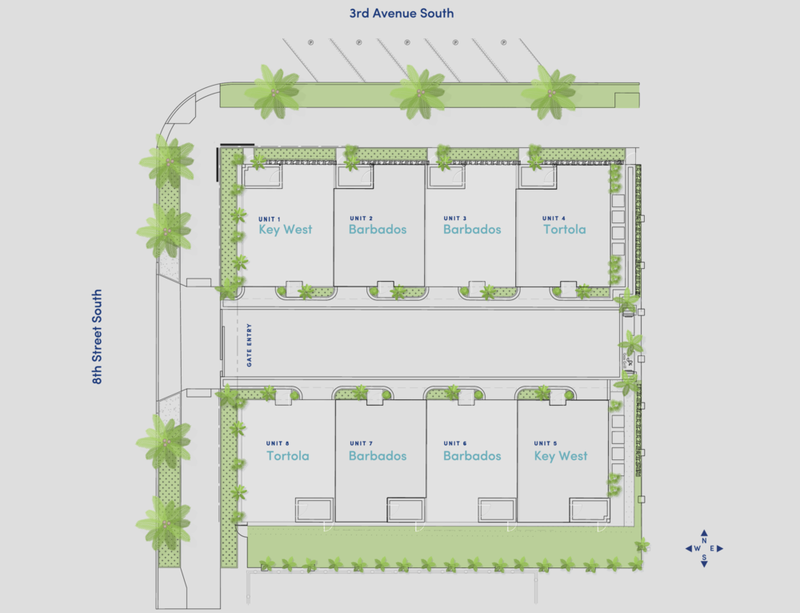 With the Saint James, we’re bringing that same style to downtown living at a more affordable price point.” Thus, the project makes use of turquoise building accents, tropical palm trees, and metal roofs that give the homes a unique coastal Caribbean feel. The townhomes are centered around an interior alley with each unit having a private single-car garage, similar to many other townhome projects in the downtown area. The private alley will intersect with 8th Street, a road which has seen a number of new townhome projects in recent years. Most notably is The Arlington, a 40-unit townhome project at 8th Street and 2nd Avenue N, which was completed and sold out in 2017, and Skye333, a 10-unit townhome project on 8th Street and Calla Terrace N which sold out earlier this year and was completed in late August. Another townhome project that was slated for 8th Street was the 801 Conway project, however that development was scrapped in July 2017 due to permitting delays. However, we’ve recently learned that David Weekley Homes will soon announce another townhome project for that site. Additionally, just last month, Aspen Venture Group demolished two single family homes at 225 8th Street N in anticipation for another boutique townhome project. It is expected that this project will have five units. The District on 9th is under construction at MLK St and Arlington Avenue and will contain 34 units, and 747 North, which is proposed for 8th Street and 4th Ave N will contain 12 units. All told, this area of downtown is booming with new townhome projects, so the announcement of the Saint James project comes as no surprise. Given the success of other nearby townhome projects, the Saint James Townhomes will likely be in high demand. Pricing is expected to start at $460K and completion of the project is planned for fall 2019. The townhomes will be sold by Realtor Carter Clarke IV of Realty Experts while Chloe Karavidas of Clear ph is handling the marketing and graphic design for the project. For more information on the Saint James Townhomes, visit their website or check out their Facebook!